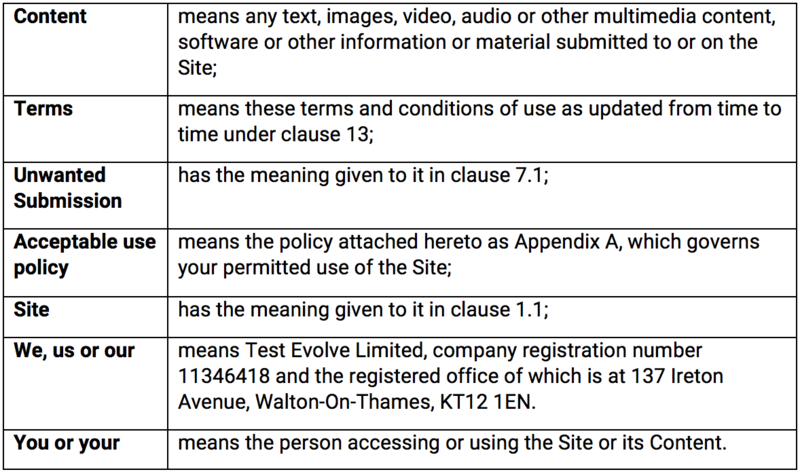 These Terms explain how you may use this website, testevolve.com and all associate pages (the Site) which is provided by us free of charge. By accessing this site, you agree to adhere to our Acceptable use policy appended to these Terms. Test Evolve Limited (“TE”, “we”, “our”) are one of the thought leaders in agile automated testing. TE collects, uses and is responsible for certain personal information about you. When we do so we are regulated under the General Data Protection Regulation which applies across the European Union (including in the United Kingdom) and we are responsible as ‘controller’ of that personal information for the purposes of those laws. We rely on the legitimate interest ground as the lawful basis on which we collect and use your personal data. Our legitimate interest is to provide you with information relating to TE products and the ecommerce industry. TE have weighed this against your fundamental rights as an individual and are content that this is a proportionate use of your personal data. We may contact you in accordance with your preferences, by either phone or email, with any news and marketing regarding all services or products offered by TE. Test Evolve Limited (“Test Evolve”, “we”, “our”) are one of the thought leaders in agile automated testing.